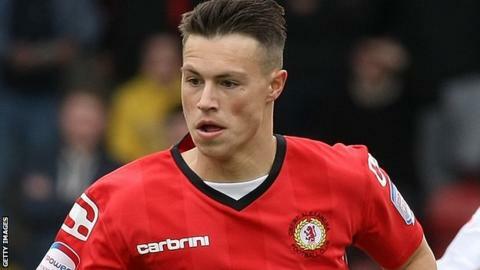 Crewe Alexandra manager Steve Davis is interested in signing Swindon Town striker Billy Bodin. Davis is also thought to be keen on one of Bodin's ex-Swindon team-mates, left-back Callum Kennedy, who has been released by the League Two champions. But despite Bodin, 20, failing to score during his end-of-season loan at Gresty Road, Davis sees potential. "You could see when he was at Crewe there's talent there and that he can be a really good player," said Davis. "He's been offered a two-year contract at Swindon and is still their player, so obviously, there'll be a fee involved," he told BBC Stoke. "He's left-footed, which is rare, and he showed when on loan at Torquay that he can score goals. "He's only just 20, but he showed talent in training when he was with us and there's a lot of potential." As for Kennedy, also a target for Scunthorpe and Yeovil, Crewe are understood to have had talks with the 22-year-old who was released by Swindon at the end of the season - and could solve their long-term left-back problem. "We're trying to fill that void and add to the balance of the back four," Davis told BBC Stoke. "The player we've looked at and spoken to wants to come, but he's on holiday at the moment. "He's an athletic, young full-back with scope for improvement, who has a cracking left foot and great dead-ball delivery. "I hope we can sort that out but we are speaking to others in case he doesn't want to come, which can happen." On the day Nick Powell left to join Manchester United, the Crewe boss admits that he is hoping to tie up another of his top young talents, left-sided midfielder Byron Moore on a new contract. Academy product Moore, 24, who scored his 10th goal of the season to seal last month's League Two play-off win over Cheltenham at Wembley, has been offered a two-year deal. "We're trying to do our best to keep our own players, which has always been the case at Crewe," added Davis.